I’ve been listening to Gordon Lightfoot for 44 of my 44 years. It’s a gimme, isn’t it? If you were alive in the 70’s, you listened to Gordo. That doesn’t mean I knew the ins and outs of the man. Actually…..I heard from a reliable source that his life took some serious wrong turns, and there may have been some unfortunate drinking involved. It was the 70’s, why am I surprised? For most of us, it’s easy to brush Gordon Lightfoot off as some musician with a ton of songs on the Easy Listening radio station. Oh wait, I like that station. Okay, some guy who makes the easy listening station easier to listen to. 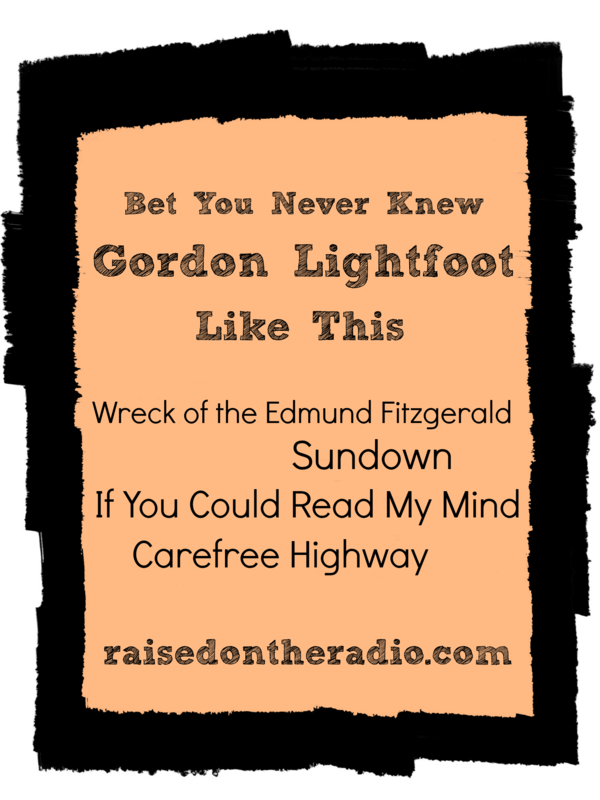 How many times have you heard Sundown, or If You Could Read My Mind on Lite FM? I admit to being stuck in the land of 70’s pop music. Heck, I’m a child of 70’s radio, and frankly, feel lucky to have been so. I often credit Gordon Lightfoot with my inspiration to be a writer. Just like a paperback novel. The kind that drugstores sell. But if you leave your knowledge of Gordon Lightfoot there. You would be missing so much. I was missing it too. It took my 8yo’s obsession with The Wreck of the Edmund Fitzgerald and then later The Canadian Railway Trilogy, for me to see it. If imitation is the sincerest form of flattery then Gordon Lightfoot has a lot to be flattered about. In 1964 he wrote “The Early Morning Rain”, and because he was a nobody, he wasn’t even the first to record it. A couple of friends who “discovered” him offered to record his song on their album. It was a good move. For both of them. He did record the song in 1966… and after that 74 other bands and artists recorded it too. Not the least of which were Bob Dylan, Harry Belafonte, Judy Collins, The Grateful Dead, George Hamilton IV (who took it to #9 on the country charts), Elvis Presley, Jerry Lee Lewis and Peter Paul and Mary (the most well-known pop version). At 13-years-old Gordon Lightfoot was already making a name for himself, he loved to sing and his parents encouraged him to do so. Between the ages of 13-17 he won multiple awards for singing. That recognition helped him find his path so he attended West Lake College of Music in Los Angeles. This decision would prove to be invaluable to him. The 60’s started a fire in Gordon, by 1964 he had already written 75 songs. However, he felt none of them really had a “sound” he could call his own. And then – he met Bob Dylan. Through Dylan, and many friends that came along with that sound, he found his sound and that sound would take him all over the world. BD: Oh yeah. Gordo’s been around as long as me. BD: “Shadows,” “Sundown,” “If You Could Read My Mind.” I can’t think of any I don’t like. Bob Dylan often covered the song “Shadows” when playing live. As I sat down to write this, I began listening to some Gordon Lightfoot songs I have very little memory of hearing, it could be I never heard them. I was inspired to track them down when I happened upon a list of all of his songs that have been covered by other artists. This one piqued my interest – after all it was covered by Eric Clapton. I found Clapton’s version of it on YouTube, and frankly, I wasn’t impressed. But that irked me, there had to be a reason that Eric Clapton would want to play that song. Right? There was. The problem is, you cannot improve upon perfection. The 1970’s would be when Gordon Lightfoot would truly see fame. Finally being recognized by listeners outside of the folk music scene, yet continuing to create using his own unique sound, his songs began to top the charts. Being a child of the 70’s, it was only natural that my experience with Gordon Lightfoot would be: If You Could Read My Mind, Sundown and of course The Wreck of the Edmund Fitzgerald. But being a lover of music, that is never enough. When a songwriter sings and plays with so much raw emotion I naturally want to know, what more? Exploring Gordon Lightfoot was something I did many years ago, to connect with my father, who was very influenced by folk music. And now again I am finding it as a way to connect with my son, to expand his knowledge of music, as I capitalize on his fascination with The Wreck of The Edmund Fitzgerald*. Every minute is a learning moment with music. With Gordon, it could be a lifetime. In June of 2012 Lightfoot’s legacy was further enhanced when he was inducted into the Songwriters Hall Of Fame. Lightfoot was honored for his role in defining the folk-pop sound of the 1960s and ’70s. There are fewer than 400 inductees who make up the impressive roster enshrined in the Songwriters Hall of Fame including Barry Mann, Jerry Leiber and Mike Stoller, Hal David and Burt Bacharach, John Fogerty, Bob Dylan, Isaac Hayes, Carole King, Paul Simon, Billy Joel, Sir Elton John, Bernie Taupin, Brian Wilson, James Taylor, James Brown, Bruce Springsteen, Jim Croce, Phil Collins, Loretta Lynn, Jimmy Webb, Van Morrison, Kris Kristofferson, Dolly Parton, Diane Warren, Garth Brooks, Leon Russell and Leonard Cohen. * Shameless plug alert. This is a YouTube video of my son singing every single word of The Wreck of the Edmund Fitzgerald 3 years ago. He still sings that song almost everyday. Gordon Lightfoot to me was one of those cool artists my Uncle Frank listened to in the 70s. To me, it was cool, that FM vibe you could get with Boz Skaggs and ELO, too. Great stuff. Thanks for the excuse to reminisce a little, Jen.